Situated in bustling Trafalgar Street, Mange Tout is a relaxed style bistro that serves a wide choice of classic French dishes. Their own blend of coffee is served throughout the day. 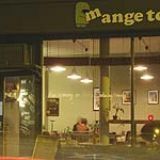 Do you work at Mange Tout? What did you think of Mange Tout? Great place for lunch...love it. Went to Mange Tout for a coffee & a chat just because the tea house/cafe we were planning to go to would be closing in 15'. On a Sunday, it's tough when many places downtown are closed around 5-6pm. So, the opening hour - to begin with - is definitely one of Mange Tout's appeal. As we sat and looked @ menu, I started to see more reasons why I should come back, and I will this Fri with a couple of other friends for dinner... Hospitality with genuineness is a magnet of this place, especially when it seems to be a scarcity here in UK. my last review did not seem to get posted. Anyway excellent all round - a real find! HIGHLY recommended on all counts - thanks for a great evening. I tried mange tout as it was near the station - I apologised in advance to my two Swedish guests (assuming normal UK food), but it was brilliant! Could not believe how good the food was (service was also excellent), thanks very much, I'm coming again!!!p.s. I had a fish dish, and my friends had lamb. All very good indeed. My favourite place to eat in Brighton. We keep going back because it's just so good and the service is perfect. We've been dozens of times for breakfast, lunch and dinner and it's always been first class - such consistency is rare in Brighton, where restaurants seem to go up and down a lot. One tiny criticism: their coffee could be better, but other reviewers seem to have no problem with it, so maybe I'm just getting fussy in my old age. This is a fabulous restaurant. The food is great and the atmosphere is chilled. We popped in for coffee and desserts today. The coffees were first class and the desserts were delicious. This is a great place to go out for a meal. One of the best in Brighton. Great, friendly staff. Eggs benedict divine. Mocha amazing. Music great. Would recommend to everyone! Just superb all round! You said you went one evening? It is always shut when I go past it on the way home from Brighton Station at about 6.30. Just interested as to what time you started and finished. Went her last night on a whim - it was raining and we wanted somewhere close to the pub we'd just left (the wonderful Lord Nelson) I couldn't have asked for a better evening. The staff were helpful and attentive - our waitress suggested we order less dishes to reduce the price as she was concerned we would be too full. So between my friend and I we shared a large Meze with side orders of chips and garlic sourdough bread - all of it was totally delicious. Unfortunately we couldn't manage it all so there was no room left for one of the amazing desserts. Everything was presented beautifully, we were given a lovely appetiser before our meal and the hot drinks at the end came with a perfect little meringue. The breakfast menu looks perfect - I'll be heading back to try that soon. All in all, this has a big thumbs up from me. 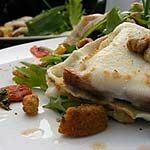 Delicious food, beautifully presented in a warm and intimate environment by lovely staff. i don't usually bother to fill in reviews but Mange Tout deserves to do really well - I hope it does. We stumbled across this lovely French Bistro a few months ago with friends and boy were we glad we did. I adore Eggs Benedict and have been searching to find a decent one again since first trying it in America a good few years ago and have got to say I was not disappointed. It came served on the most delicious sour bread and had I have known how good the sauce was going to taste, would have asked for more (which a couple of lads did sitting next to us - which came served in a couple of extra pots). Presentation was also good. I noticed a couple had something served on a piece of black slate which looked really good and tastefully done. I am visiting Brighton again tomorrow and am going to treat my teenage daughter in there tomorrow. Our friends who came with us and leave nearer have since returned. The staff could not do enough for you and were extremely friendly indeed. All in all a fantastic find. Thank you! What a great authentic French neighbourhood bistro!! As my partner lives down the road it's a shame we only found it today but what a find!! We decided to stop for a coffee and get out of the rain and because they were busy didn't think they would want us to sit just for coffee. They were incredibly kind, knowledgeable and polite and sat us and our groceries at a table for 4. We ordered drinks but after seeing all the lovely food coming out we decided to share the Chevre Tartine and glad we did. It came out quickly and was huge with 2 large rounds of chevre lying on a delicious compote of tomato all on toasted chewy and delicious sourdough bread. The waiter/owner? was great and he answered my questions about how to say walnut in French. We weren't rushed and were made to feel special. Everyone connected to the place was great and whatever you do run don't walk but do me a favour..save me a table because we will be coming back hopefully for a long time!! A definite 5 Star establishment!! Bon Appetit!! Hang on, I didn't see how to give it a star rating so it's given it three on my behalf! I actually would give it five. What a stupid system. Anyway, here's five now. Bah! First class, absolutely super. Great food, impeccable service and very friendly. When my stupid husband went outside to inhale nicotine, one of the waiters came over to talk to me so I didn't feel as daft as I looked, sitting on my own. How thoughtful can you get? My first choice for dinner in central Brighton; it's really worth a visit and it takes a lot to impress me, it does. The most amazing hollandaise sauce I have ever eaten.Very friendly and welcoming. I am gluten free and chatting to the waiter he said if we called ahead next time he would get some gluten free bread in. How is that for service! Sadly we are not from Brighton but will definitely go back to Mange Tout next time we are in the area.